Figure 1. 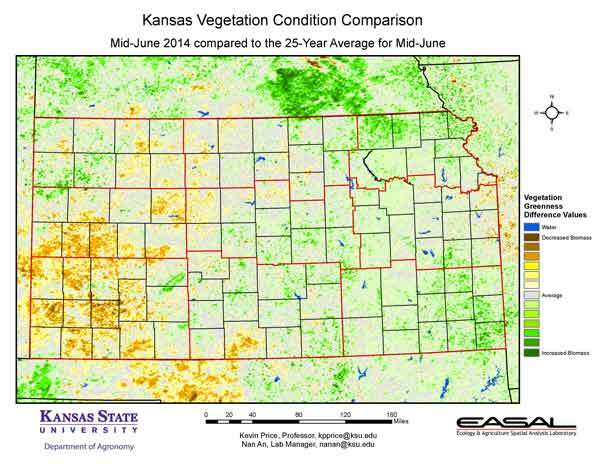 The Vegetation Condition Report for Kansas for June 10 – 23 from K-State’s Ecology and Agriculture Spatial Analysis Laboratory shows that vegetative activity is high in the eastern third of the state, due primary to favorable temperatures and moisture. Increased biomass production can also be seen in the Central Division, particularly in Ellsworth, Saline, and McPherson counties, which have had some of the largest precipitation totals. Figure 2. 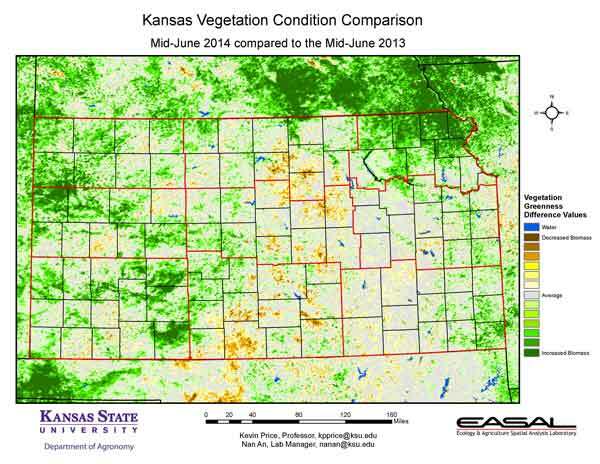 Compared to the previous year at this time for Kansas, the current Vegetation Condition Report for June 10 – 23 from K-State’s Ecology and Agriculture Spatial Analysis Laboratory shows that the extreme northeastern area of the state has seen the largest increase in photosynthetic activity. In the west, the increase in biomass production is particularly evident in northern Wallace County and northern Clark County. This increase does not necessarily mean good conditions, as can be seen in the following map, just better than last year. Figure 3. 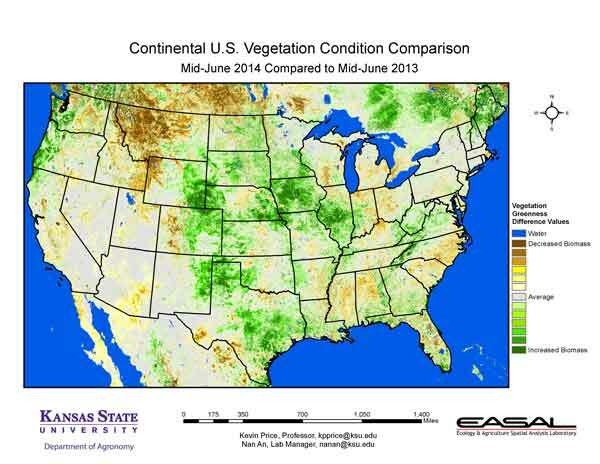 Compared to the 25-year average at this time for Kansas, this year’s Vegetation Condition Report for June 10 – 23 from K-State’s Ecology and Agriculture Spatial Analysis Laboratory shows that while the eastern half of the state has close to average biomass production, the West Central and Southwestern Divisions still show below-average photosynthetic activity. Extreme drought is still prevalent in this area of the state. Figure 4. The Vegetation Condition Report for the Corn Belt for June 10 – 23 from K-State’s Ecology and Agriculture Spatial Analysis Laboratory shows that the highest photosynthetic activity is concentrated in the northern and eastern portions of the region. Parts of the upper Missouri River Basin continue to have excessive soil moisture, which has limited plant development. 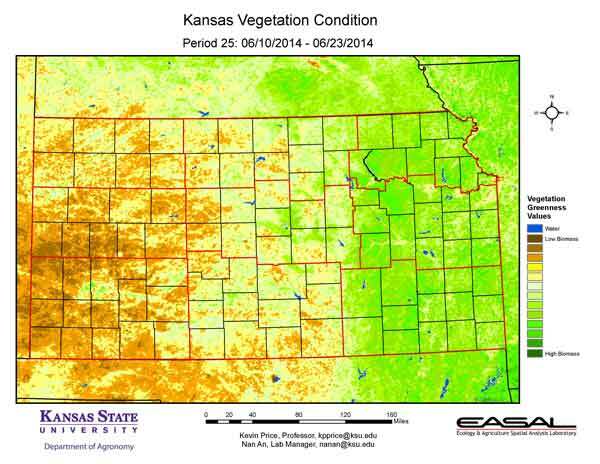 The southwestern region of Kansas still continues to show extreme drought. Figure 5. 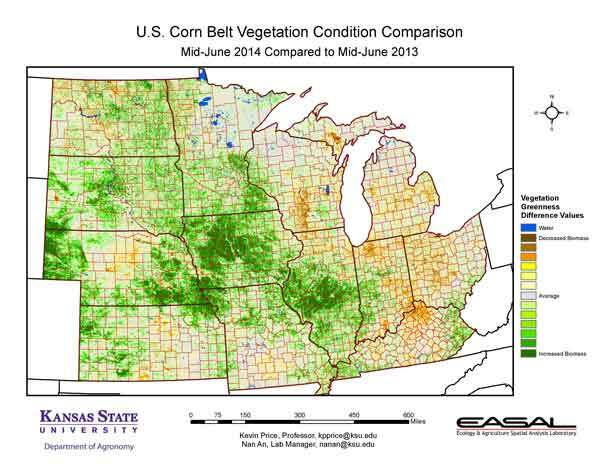 The comparison to last year in the Corn Belt for the period June 10 – 23 from K-State’s Ecology and Agriculture Spatial Analysis Laboratory shows that much of the region has higher biomass production this year. This is particularly true in northern Iowa and southeastern Nebraska. In Iowa, 70 percent of the corn is reported in good to excellent condition. Figure 6. 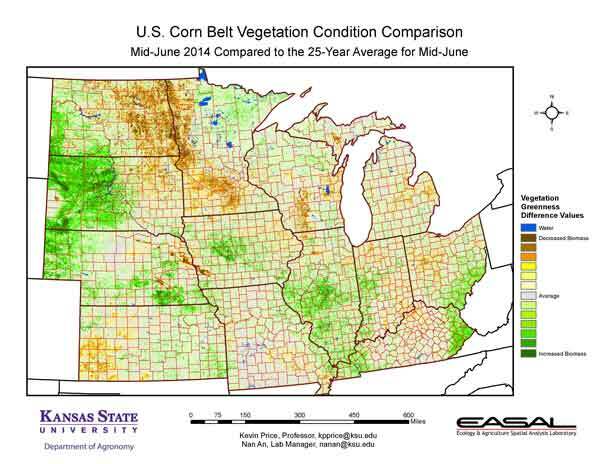 Compared to the 25-year average at this time for the Corn Belt, this year’s Vegetation Condition Report for June 10 – 23 from K-State’s Ecology and Agriculture Spatial Analysis Laboratory shows that the biggest differences are in the northern and western parts of the region. 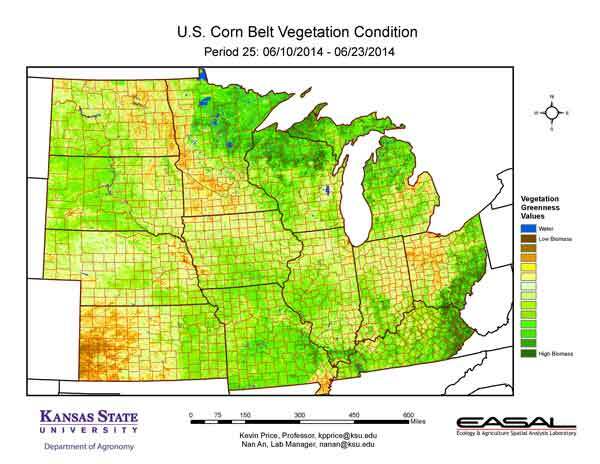 In western South Dakota, favorable temperatures and moisture have resulted in above-average plant productivity. In eastern North Dakota and western Minnesota, the below-average activity is due to excessive moisture. Some locations in the region are approaching record rainfall totals for June. Figure 7. 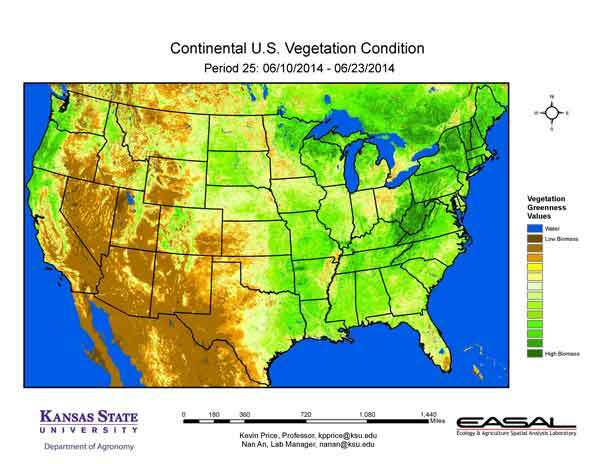 The Vegetation Condition Report for the U.S. for June 10 – 23 from K-State’s Ecology and Agriculture Spatial Analysis Laboratory shows that there is a typical east/west divide in biomass production. The highest levels are in the eastern U.S., particularly in West Virginia and central New England. Figure 8. The U.S. comparison to last year at this time for the period June 10 – 23 from K-State’s Ecology and Agriculture Spatial Analysis Laboratory shows that the biggest increase in productivity is in the central U.S. This is particularly true in eastern Wyoming and in Iowa. Last year, eastern Wyoming was in extreme drought; this year it is drought-free. Figure 9. 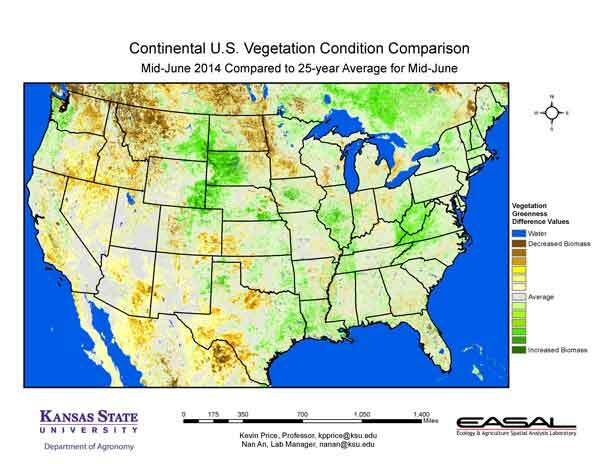 The U.S. comparison to the 25-year average for the period June 10 – 23 from K-State’s Ecology and Agriculture Spatial Analysis Laboratory shows that the biggest departures are in the northern Plains. Higher-than-average photosynthetic activity is evident in western South Dakota, while lower-than-average values are present in western Montana and eastern North Dakota.